New skills for new thrills. Left foot up on peg. So, on Friday it was decided that ‘today was THE day’. I confidently donned my helmet and pushed one of Matthew Feiner’s high wheelers out to the back parking lot of The Devil’s Gear. How hard could this be? I had seen Matt do it countless times with ease. I had faith in the powers of gyroscopic balance. The bigger the wheel the better the balance, right? Right? 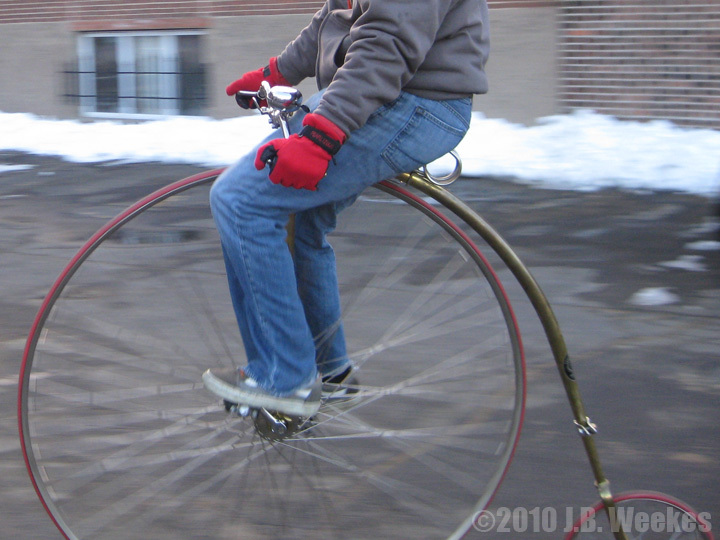 I put my arms out at shoulders length and grasped the ends of the handlebars. Then, I took a couple strides and placed my left foot onto the rear peg while kicking along with my right. I immediately realized that it was necessary to time the speed of the right pedal as it came around. Ideally, I thought, mounting the saddle should coordinate with the right pedal passing the apex of the pedal stroke. I stopped and started over again. Hands on bars. Strides. Left foot up. Right pedal coming around. Here we go! I place weight on my left foot. Step up with my right to the pedal. 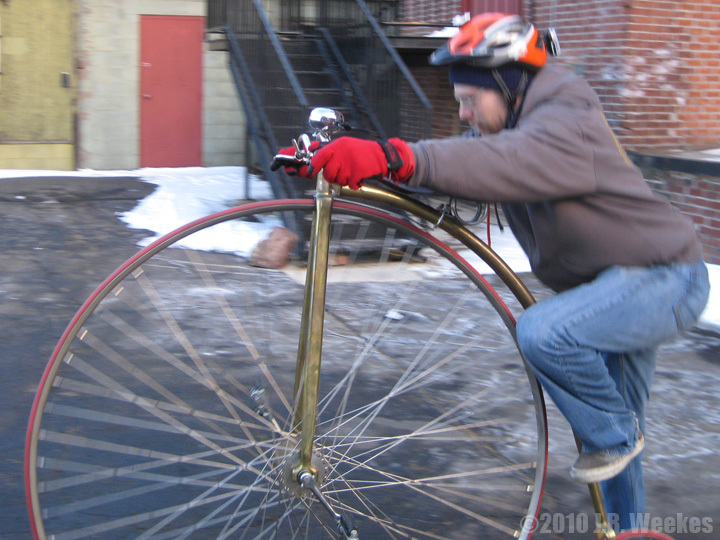 As my weight transfers to the right pedal the high wheeler quickly gains speed and balance. I get my left foot onto the pedal and start off across the parking lot. Whoo hoo! This IS fun! I really feel like the very first time I rode a bicycle. I quickly realize I need to turn. I move the bars. Not much. Quick. I remember Matt saying something about using your hips. I steer left and move my hips right. There we go. Not too bad. I manage a couple of loops around the parking lot before I decide to try to get down. How to get down? The opposite of getting up? Jump? I opt for trying to climb back down. 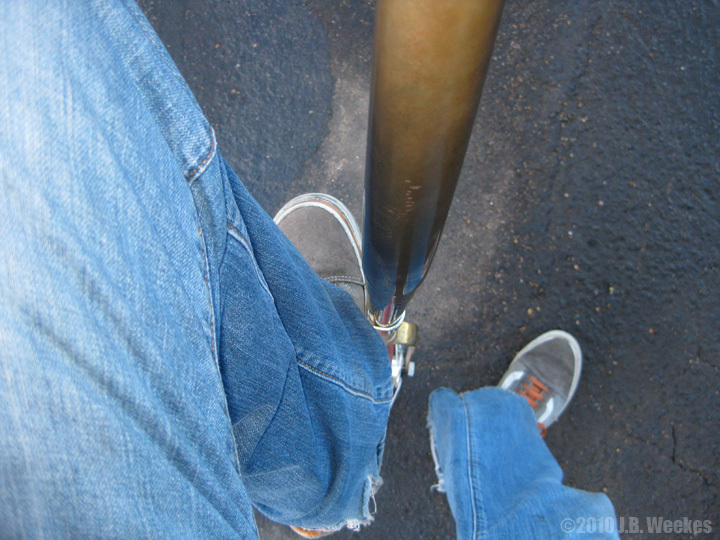 Without thinking I take my left foot off and reach back to feel for the peg. Shoot. Timing! I forget that the right foot is still on a pedal that is connected directly to a large wheel in motion. My right foot rounds the top and the high wheeler lurches forward. I missed the peg and try to remount but, the high wheeler is pitching heavily to the left. I jump off and try to keep the bike from going to the ground. But, unfortunately, I failed miserably. I landed on my knees and left hand and the high wheeler fell onto both myself and the parking lot. I was so disappointed with myself for missing the timing and hitting the pavement. I jumped right back up. I got right back up on that bull. And I rode it around the parking lot for the next 20 minutes. I practiced getting off again and again. Matt gave me some pointers on slowing down and riding it slowly from the back peg. It was awesome. What? Awesome! Next step is practicing out on real streets. After that? Downtown New Haven. Next stop, downtown New Haven!